tim noakes books Archives - PaleoMunch! Tim Noakes is no doubt one of the most important people in the nutrition and athletic diet strata of advice. He is also one of the few authoritative figures who has refuted his claims. To me, that means that his advice has come from a place of honesty and accuracy. Scientists, like Prof. Tim Noakes, are constantly seeking the best solutions for their respective “problems”. By problems, I refer to their individual areas of work. Tim Noakes has particular interest in the human body and how it deals with exercise. A great topic to be an authority in then! The human body is an amazingly resilient machine, and deals with exercise in very specific, focused ways. Specifically for me, one of the most interesting ways the body operates after and during exercise is with hydration. Below, I’ve listed three of Tim Noakes’s books, and I’ve broken down what they are about. If you are in any way interested in the body specifically when it is dealing with the stress of exercise, you will definitely find something interesting in each one of them. 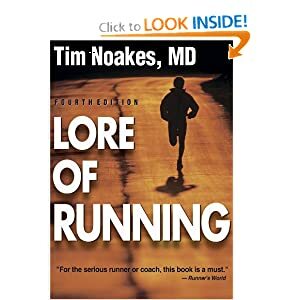 In his book, Lore Of Running, Professor Tim Noakes takes a look at how you can develop effective training regimes for running. All the facts he presents here are based, or rather, were based on current time research into what makes for proper training programs. The book is not aimed at those wanting a turn-key running program “generator”, but rather those who want to learn as much as possible about their bodies when exercising. In the book, Prof Tim Noakes makes scientific mumbo jumbo make sense, and if you are willing to take some time to understand exactly what he is teaching and writing about, the Lore Of Running is definitely for you. Tim explores areas such as temperature regulation, injury prevention and topics which self-taught runners will find imperative to their running success. Overhydration is a real problem in sports, more so perhaps than you even thought possible. The concept of “hydrate, hydrate, hydrate!” is over and dead thanks to the huge amount of research done in Tim Noakes’s Waterlogged. Noakes takes head on and dispels all information forced onto people by the media, such as why sports drinks are a “good” idea, and how facts about hydration are much more important than some companies “research”. If you are an active person you have probably had a spell with dehydration, but probably not with over hydration. 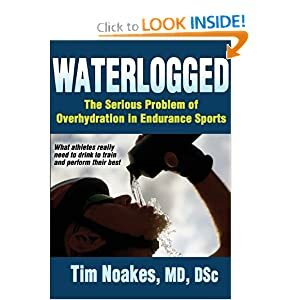 This book sheds a spotlight (not just a light) on why both are bad for you and how you can find the optimum level of hydration for whatever form of exercise you are doing. The book itself is around 500 pages, and contains many, many, references. This should be on any active persons must read list! Tim Noakes once again cuts through all the chaf and attempts to find the right answer for diets and aims to explain away the worlds obsession with low fat and fat free diets. His recent turn to the paleo diet obviously resonates with me and the community on a very deep level, and I think that if a man of this calibre advocates a low-carb, high-protein diet like the paleo diet, then my ears and many other’s are pricked up and ready to listen intently. I haven’t had the chance to read this book yet, I am planning on dedicating some solid time to it though, so keep watch for a further write up on it. 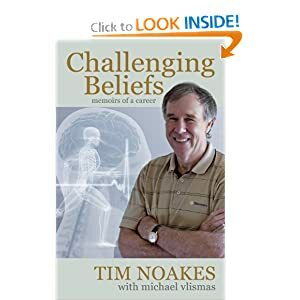 I hope you find as much knowledge in Professor Tim Noakes’s teachings as I do, and I hope that he can make a great impact on your life, just as he did mine and many others like me.